Samsung has today reentered the Windows tablet market after a while away, and it’s managed to do so with what strikes more than a passing resemblance to its current Android-powered offerings. The first Windows tablet to carry the Galaxy branding, Samsung’s new Galaxy TabPro S is probably one of the most awkwardly-named tablets money can buy, or at least it will be when it goes on sale globally some time in February. Samsung hasn’t yet announced pricing for the tablet, though it has confirmed that both WiFi and Cellular versions will be available. For as yet unknown number of dollars, you’ll get a 12-inch Windows 10 tablet that features a typical Samsung screen – Super AMOLED – and said to be every bit as good as you’d expect. 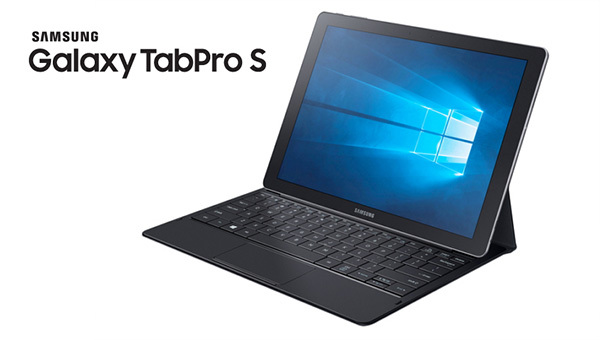 The Galaxy TabPro S features a 2160 x 1440 pixel resolution and is so energy efficient that Samsung is claiming a full 10.5 hours of battery life from the built-in 5200 mAh battery from a single charge. Behind that screen, Samsung has crammed in an Intel Core M processor, 4GB of RAM, and a generous 128GB of storage. GPS and NFC chips are also present, should you need to do some map reading or mobile payments while out and about with your 12-inch tablet. It also features 5MP camera both on the rear and front. There’s also the keyboard case which attaches to the screen for typing. Speaking of keyboard case, it comes included with every purchase of TabPro S. Microsoft, Apple and Google, please take note! 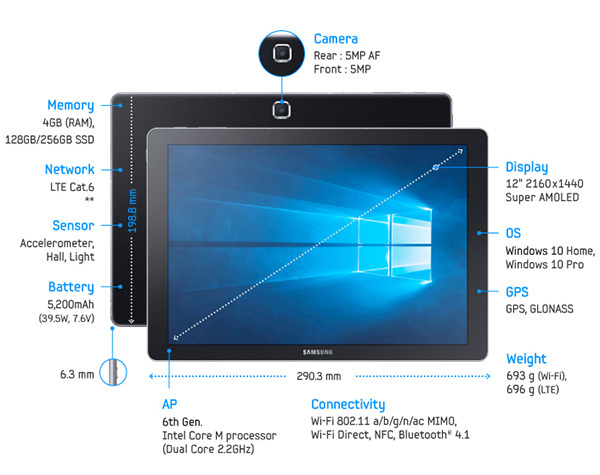 Clearly going toe-to-toe with Microsoft’s Surface Pro 4, Samsung’s offering is thinner and lighter thanks to its lack of any fans, but that means it also doesn’t have the array of connectivity options some may expect. Samsung will be offering a hub that will give users access to HDMI as well as USB Type-A and Type-C ports to go with the one Type-C port that can be found on the tablet itself, though. Samsung has found a way to offer added value to those using its smartphones too, with software allowing users of Samsung’s handsets to utilize their fingerprint scanning abilities as a means to authenticate themselves against the Galaxy TabPro S. It’s a handy trick, though we’d rather just see a fingerprint scanner on the tablet itself, if we’re absolutely honest. Without pricing, we can’t really judge the Galaxy TabPro S at all. How can anyone compare the device with Microsoft’s Surface Pro 4, for example, until we know whether it’s going to cost more or less than its competition? The answer is we can’t, so we won’t. More information to come as we get it!